Pension is always the primary source of income for most retirees. Those who own property also manage to earn an additional income through monthly rent after retirement. Systematic Withdrawal Plans (SWPs) can be your old age companion too if you invest well when young. 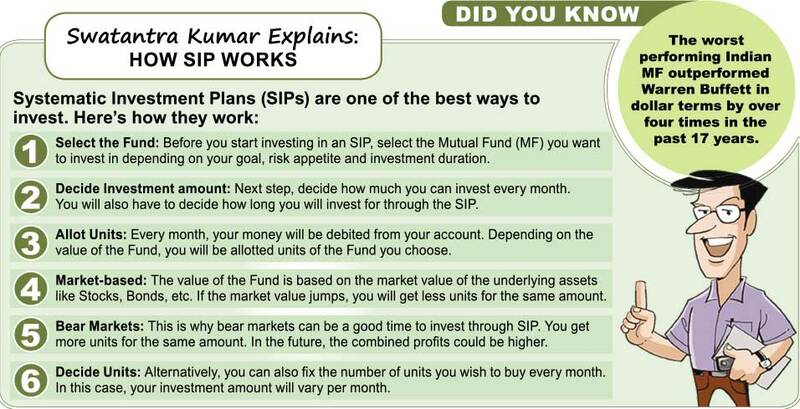 SWP is the opposite of SIP (Systematic Investment Plan). It can help you withdraw your retirement income just like a monthly income scheme. The only difference is that you get to set the monthly amount. The onus of the amount you draw each month through SWP is on you. In a Dividend plan, Dividends are declared by Mutual Fund schemes. However, the pay-outs are neither fixed, nor guaranteed. If there are no realised gains, there will be no Dividends at the end of the month. SWP offers you a defi nite cash fl ow at your pre-determined time period. Therefore, it can ensure that you live your regular life even after your retirement. Say, you took your family out for trips every year when you were working. You can continue this even now – Regular Tha, Regular Rahega! Annuity and Mutual Funds (through SWP) are based on the same principle of fixed income. However, annuities are Taxable. They cannot give you inflation adjusted returns. Further, you cannot change your withdrawal amount in annuity. If you invest your money in Mutual Funds, you can choose your suitable SWP. You can change your SWP amount. You can choose assets that can offer you returns over and above inflation. Further, you don’t have to pay any Taxes if your Long Term Capital Gains (LTCG) is below Rs.1 Lakh. The 2018-19 budget introduced 10% Dividend Distribution Tax (DDT) on dividends distributed by Equity Funds. Therefore, those who have opted for a regular dividend option in Equity-based Funds will pay more Tax. SWP is an alternative which can be used to avoid DDT on your retirement income. Here, you can avoid Tax if the LTCG on your SWP amount is less than Rs.1 Lakh. Therefore, the SWP route is more Tax efficient than the dividend route.